How can community development relate to the broader goals of racial equity? I could never refuse Joe McNeely anything. The founder of the Development Training Institute, the Central Baltimore Partnership, board member of NACEDA (the National Alliance of Community and Economic Development Associations), and a true exemplar of a cool dude asked me to share some thoughts with folks around community development, social justice, and race. How could I say no? By the way, can you do it in 1200 words or less? Wow! At first I was flattered to be asked. Watch out Ta-Nehisi Coates!! On second thought … hey, wait a minute! How come the black lady gets to talk about social justice and race?! Why is it when people feel the need to explore issues of social justice and race, they ask a black person to do the talking?! Could it be that non-blacks feel that they have less right to speak on this? Is it too cool (too cute?) to be the white, middle-class person talking about injustice? When did we break down by race who gets to talk and who gets to advocate for equality and decency as it relates to our sector? Somebody famous once said, or did they? Now back to the matter at hand: social justice and racial equity in community development. Martin Luther King once said … no, wait. They’ve heard and read that one before. Supreme Court Justice Thurgood Marshall had this to say … no too long. Besides, there are just enough reformed lawyers in community development not to make this joke funny. How about the poet, Maya Angelou? … no, no, no too esoteric. Why is this so hard? Oh wait, that’s right. The reason it’s so hard to talk about community development’s relationship to social justice and racial equity is that the very idea of it — the history and the effects of it — speaks to the sector’s creation as a radical and aggressive response to America’s social and racial justice fight. We (the collective WE of resident volunteers, CDC staffers, funders, and government officials) have been too close to the fight to see what is really around us and how what we are doing is nation building (wait, nation healing?) at its very essence. We are continuing the fight at the block, city park, community meeting, and neighborhood levels. Our work … no stop fronting1 … the work of our member organizations is guerilla warfare and targeted drone deployment while also being neighborhood block party and kids’ magic show. For us and for our members it’s more of the same but it isn’t. Most particularly now, we need to see our work for what it is as we seek to build new voices (new weapons and battlegrounds?) for the future. Have you ever noticed that the most vital and valued things in our lives are the places and people we ignore or forget about until they are under threat or are gone completely — like your old neighborhood and beloved granny, or the field of community development and maybe even Democracy? At the Philadelphia Association of Community Development Corporations (PACDC) Equitable Development Conference in 2017, the keynote speaker, noted psychologist and author, Mindy Fullilove talked about the growing chasm of political and social ideology in our country. She said that if radical work wasn’t quickly attended to, we could see our country fall into a civil war. Wait, what? Doc, no, that seems too extreme. But is it? Given increasing incidents of one-off violence and organized fringe-right-wing and fringe-lite causes, I am not so sure now. How can our work better respond to this growing chasm? We talk often about professionalizing our sector. But maybe we should return to our earlier roots and radicalize our work by opening more doors for unusual suspects to join in as paid staff and/or volunteers. There are entire neighborhoods in Philly, Newark, Boston, Los Angeles, Houston, and beyond where a significant percentage of the young adult population is returning from incarceration desperate to make a change in their lives and the lives of folks in their communities. There is also a growing cadre of experienced and savvy senior citizens and whip-smart high school youth looking to step up to the plate and make their communities stronger and more resilient. Yet with such diverse talent — namely non-white, and without a graduate degree in urban planning — would a CDC or a CDC association consider hiring them (for money)? Hire convicted felons? Old people and kids?!! Put down the kombucha juice and kale salad for just a moment and consider that as creative as we are as a sector in finding money to build things, we can and must be equally creative in working to find ways to build communities with people — all kinds of people. In late spring of this year, PACDC hosted a half-day training on community organizing for neighborhood leaders. The sessions included a retired Mayor, a retired city councilman, and smart, passionate high school students eager to learn about what they could do to stave off the violence and isolation in their communities. Did I mention in those sessions we had a rich mix of races and socio-economic statuses as well? Can you imagine what our neighborhoods and country could look like if these unusual suspects suddenly became the leaders of our field? Alright, alright, I know what you’re thinking. Nice words, but where did you find those folks and how exactly would we pay for this so-called radicalization of the field? You’re thinking it’s too hard to work on cultural shifts in our sector’s identity, funders won’t support this work, blah, blah, blah. Ahh, poor babies. Get over it. Now hear this: If we don’t change who is doing the work, the work of the collective WE will no longer continue to exist. If our industry went away tomorrow, do you think our neighborhoods and the people that live and do business in them would all disappear too? Would the problems go away if we don’t see them? Could we consider the possibility that our industry may and probably will shrink? Out of sheer necessity, we will have to rely on the unusual suspects to help carry the water for their communities in small ways (block clean ups) as well as large (neighborhood planning and visioning). If you have some time and you are in Philly, come visit with my friends at the Village of Arts and Humanities, which runs the People’s Paper Co-op. Or meet the folks at Quaker City Coffee. Both of these entities — one a nonprofit and the other a social enterprise — are working with a diverse and rich cross section of folks re-entering society to do some good in their communities. The Village is also working with young people in a variety of ways to be the next wave of advocates and activists in their communities. If you stop by with some notice, we can share some food and chat with them. No kombucha or kale! But I bet you a bacon-egg-and-cheese that if you look, there are groups in your community doing similar work that you can learn from too. Now, let’s put on our big girl and boy pants and try to remember when our industry was just starting. (I hate that phrase industry — industries die but the fight for justice and just plain decency can never be killed or starved even when neglected.) Can we imagine when our sector’s early days started in the basements of houses of worship or in the living room of Ms. Myrtle? (You know you have a Ms. Myrtle in your community.) Think how hard it must have been. Can we imagine the radical audacity, the daunting and intimidating task of helping people live with dignity and decency in a new home that doesn’t leak when it rains or let in the cold? Can we fathom the herculean task of transforming communities where most people were leaving into places where everyone is fighting to stay? While it isn’t much easier now to do this work, it is better with broad networks of knowledge and experience to help smooth the path — a bit (thanks NACEDA!). To repay the debt that we owe those folks who came before us in basements and living rooms, we need to look back at our past as we shape our next steps. We need to get more Ms. Myrtles, more young men and women coming out of prison, more teenagers, and more documented and undocumented immigrants trained, supported, and prepared to help us in our work — and to step in should and when the battlegrounds get still more intense. That is our work. It is the full embodiment of democracy’s promise to us and from us to it. Now, let’s (let us all) get back to work and help continue to build our country by strengthening our neighborhoods. That’s all from the nice black lady. Hey Joe, do I at least get a discount on the next NACEDA event for this? Pamela Bridgeforth is director of programs for the Philadelphia Association of Community Development Corporations is indeed nice and very much hates kombucha and kale. We’re all here because we recognize injustice and decided to do something about it. While we may at times get caught up in our day-to-day, I still believe that our driving mission to uplift our communities will never be in doubt. It was true decades ago for the elders that founded our movement and, in these times of divisiveness, remains more important than ever. Because there is plenty of work still to do and, sadly, plenty of injustice still to confront. To be clear, at the heart of injustice is usually race. What’s really around us is the ongoing struggle to address centuries of systemic oppression, and the need to chip away at a legacy of racism that continues to leave entire communities behind. Many of our elders experienced this first hand through redlining, urban renewal, and racist immigration laws. They took action, forming some of the most influential community development organizations around today. Now we, as community economic development practitioners, inherit this work. I formerly worked for the National Coalition for Asian Pacific American Community Development (CAPACD), a national coalition of place-based organizations serving Asian Americans, Native Hawaiians, and Pacific Islanders. Among my most memorable moments were the times we brought community members of color – housing counselors, resident managers, and case workers – to Washington to speak directly to policymakers. Many had never been to a federal agency, had never even seen a cabinet member up close. Some were nervous and unsure of what to say. Yet once the subject turned to their communities, you could feel the room flip. Suddenly the agency staffers were hearing things they’d never heard before and were nervously thinking of how to respond. It was always an awesome thing to see. These moments remind me that our expertise and access as associations are not an end, but a means by which voices (weapons?) are elevated and heard. There are plenty of new leaders rising today, like the folks running reentry programs that Pamela mentions, and we have so much to gain by welcoming new voices and new perspectives of color to our (at times) old-school community economic development world. And finally, let’s not shy away from talking about race. Pamela raises this in the first paragraphs of her piece, and I believe it’s an incredibly important point. As Frances Frei, a professor at Harvard Business School, has said, “diversity should not be the burden of the diverse.” Because if communities of color could fix this stuff alone, it would’ve happened yesterday. It’ll take all of us – from executive directors and program directors to assistants and interns, from frontline activists to supporters and allies – putting out heads together and learning from one another, to truly evolve our field and find relevance in a changing America. 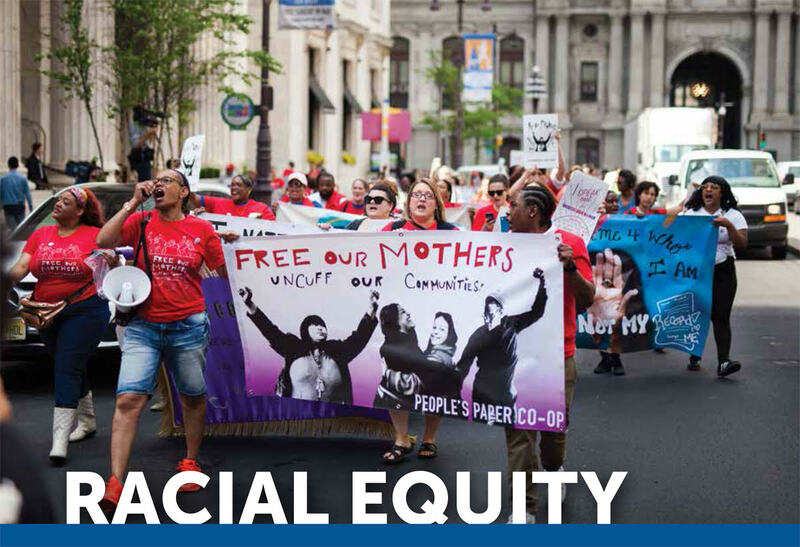 Achieving racial equity is key to a just society. Longstanding racial inequities pose barriers to the overall health and well-being of citizens and communities alike and should be of particular and paramount concern to policymakers and community development practitioners. In order to ensure representation and inclusion in our work, the Neighborhood Preservation Coalition of New York State (NPCNYS) researches what is happening on the ground, and then tracks that back to policies and programs, or the lack thereof. We look at the state policy and program landscape and ask questions related to inclusion and representation, questions such as: who has access to wealth-building opportunities like homeownership? Who is overrepresented and underrepresented in mortgage lending? Are living wage jobs available and broadly accessible? What are wages like between racial groups? The answers to these questions provide important clues about the health of our communities and our state. I am disappointed to report that in New York State, the answers to these questions highlight racial inequities. Black, Latinx, and Asian residents are underrepresented as homeowners, with 66.5% of White residents owning homes compared with 29% of residents from communities of color. In fact, New York State has one of the lowest rates of homeownership by people of color among all 50 states and the District of Columbia. Only Rhode Island has a lower rate. Compounding the issue is the percentage of high cost loans made to Black and Latinx borrowers, 7.75% and 6.86% respectively, compared with 3.05% for White borrowers. The median income for Black households represents only 62.5% of what White households earn; for Latinx residents, that figure is 61.4%. The referenced figures provide stark evidence of racial inequities. For the past several years, NPCNYS has been working with its members to better understand how the above statistics relate to local need – and how that local need is met or not met by the present constellation of state funding programs available. What we have found is that while there are good and widely used state programs, they are simply not enough. NPCNYS has long argued that we need a constellation of state programs and funding, which can be layered: no one program can be all encompassing. We have also pushed for every state housing program to track demographic information, such as race, so that we can see if we are investing state money equitably. We have a clearly defined problem, which means that we must also have clearly defined solution. But that’s where this gets tricky. I often find myself thinking – and sometimes saying – “You are trying to simplify a complex issue.” And then I turn around and think and say the converse, “You are complicating something which should be simple!” And indeed, the notion of equity is simple: ensure people have what they need to be successful. Equity is fundamentally tied to the pursuit of life, liberty, and happiness. As Americans, we should be able to grasp a concept that is essential to our democracy. But it is finding that agreement on how to achieve an even playing field that gets complicated. Calling something by its name, therefore, has power. Addressing injustice is power. I am proud to represent a network of organizations that speak truth to power every day and has done so for many decades. This year, we are going to unite our voices to push hard for the creation of a dedicated statewide fund to help address our state’s inequities in homeownership. As an organization, we have a core belief that housing is at the very center of people’s lives. A home is where we feel safe, secure, and loved. A home is the key everyone needs to unlock an equitable and just future. Cara Long Corra is Executive Director of the Neighborhood Preservation Coalition of New York State. The history of community development goes back to the Civil Rights Movement and African American churches. Our field began during a time when African Americans and other marginalized groups could not even go to a bank. Churches were the only institutions with the means to coalesce resources in the African American community. So, churches provided loans and equity investment to buy homes, start businesses, and get an education. The credit unions and CDFIs of today owe their beginnings to church-based loan funds. In my ministry with the United Methodist Church, my core work involves helping the faith community to step up and recognize that they have a role to play in community development. We have about 850 United Methodist churches in South Carolina. If 25% of those churches became involved in community economic development work, they could have a huge impact on issues of poverty and inequity within the African American, Hispanic, and Native American communities. Every state has a willing faith community that wants to engage in this work. It’s a matter of finding the thought leader who aligns with this understanding of the social gospel; finding the church that’s interested in being relevant to the community now and not just preparing for the hereafter. Once you find that faith community, they will be willing partners. The community economic development model helps equip faith communities to improve the lives of people in low-income communities. Here in South Carolina, the Charleston Area Justice Ministries assembles 1,000 people to get behind a social justice issue each year. This year this multi-denominational group decided to get behind an agenda to address affordable housing, which is under assault by state and federal policy. We can have tremendous success in the improving economies of low-income places when the faith community recognizes their role in community economic development. The political climate we’re operating in makes it even more important to nurture connections to the faith community. We’re seeing forces push back on the work we’ve been doing for the last 40 years. We’re seeing real-time oppression and escalating economic disparities. It is time for us to look in the mirror and make sure we stay focused on the core tenets of community development – equity and equal access. As community economic development tries to align with market-oriented strategies, we run the risk of leaving behind the very groups we started out trying to help and violating our core tenets. Our mission is to put tools in place that marginalized and under-resourced people can use to engage in the economic system. We need to stay vigilant to prevent them from being worse off than they were just a few years ago. Bernie Mazyck is president and CEO of the South Carolina Association for Community Economic Development and an ordained minister of the South Carolina Annual Conference of the United Methodist Church. How would the work of our field change if we all agreed that our top priority was advancing racial equity? In what ways do you think a consciousness of racism is central to the work we are doing? How do we ensure the field's professional practices reflect a commitment to advancing racial equity?